Everybody wants to have a solid financial plan, but over 40% of Americans don’t have one. Unless you develop a formal strategy – like a written plan – it can be tough to accomplish a financial goal of any type. And let’s face it, if you do accomplish your goal it’s more likely luck has more to do with it than your financial savviness. The goal is not the main thing. It’s deciding how you achieve and stay w/ the plan that counts. 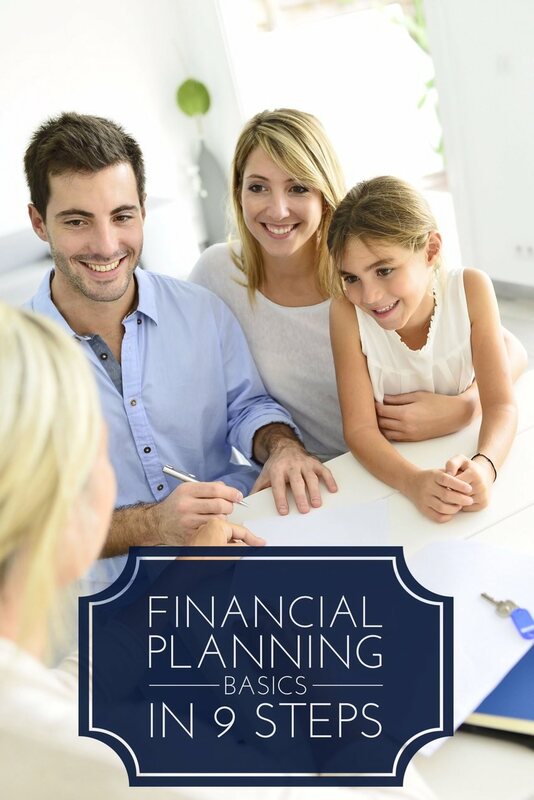 Let’s go over some financial planning basics, that will help you to establish a financial plan that will have concrete steps you will actually be able to accomplish. This gets down to answering the question What is my financial plan? You have to decide exactly what it is you need your finances to do, and what those strategies will need to accomplish. Once you establish goals, it will simply be a matter of creating a plan as to how you will get there. For example, do you have children who will need to attend college day? If so, you’ll have to save so you will have money available to make it happen. At what age do you hope to retire? That will help you to decide how much time you have to save, and then to establish how much you can save to meet that goal. Do you want to get completely out of debt? If so, will have to add up all of the debt you have, and determine how much you have available to pay toward it, and how much time it will take. It’s very important for the client and the planner to keep goals realistic when defining them. Some planners will tell the client what they want to hear, while good planners will tell them what they need to hear. Also, paying a financial planner can be wasteful if you fail to put their recommendations into action. It’s like going to the doctor and then refusing the prescribed medication. Once you have your goals established, it will simply be a matter of working out the details as to how you will accomplish them. But you can’t do that until you have a solid plan, and that’s why creating one needs to be the first order of business. There’s no getting around the fact that any type of financial planning is going to require creating surplus money in your finances. Whether your goal is to retire at a certain point your life, or to payoff your mortgage, you will need extra money in order to make any such goal a reality. This is why a budget is so important. A lot of people skip this step, and that’s the reason why they never accomplish any kind of meaningful financial goals. A budget enables you to see exactly how much money you spend each month, compared the amount of income that you earn. It will help you to see where you’re spending too much money, and where you might be able to make some cuts that will enable you to direct the money to where you want it to go. Many people view budgeting negatively because they believe a budget is all about saying “No.” In reality, your budget is equally about saying “Yes.” Being in control of your spending gives you the ability to say “Yes” to the things that really make life meaningful. You are also able to enjoy your expenditures more when you eliminate the stress of constant overspending. So next time you start hating on your budget, start asking yourself what you want to say “Yes” to. It may help you start saying “No” with a smile. Once you have a budget in place, you’ll know exactly where your money is going, and you’ll be able to prioritize and also to redirect the flow of your money. You can start by identifying necessary expenses. These are budget items that must be paid no matter what – your house payment, debt payments, insurance payments, and taxes. You can think of these as being non-negotiable expenses. The next category can be important expenses, but those over which you have large degree of control. This can include groceries, utilities, and work or school related expenses. All are necessary, but you have the ability to cut these expenses at least to some degree. The third category are pure discretionary expenses. This includes entertainment, vacations, and recreational shopping. These may be desirable, but they’re not at all necessary. These are expenses you can eliminate completely, without threatening your survival. Once you put your expenses in the proper categories, you’ll be in a position to make reductions or complete cuts. For example, you can reduce your important expenses, but completely eliminate one or more of your discretionary expenses. Making these kinds of cuts frees up your cash flow which you can direct into savings or to debt payoff. But you have to make certain expense cuts in order for that to happen. Once you have identified significant expense cuts in your budget, the next order of business is to set up an emergency fund. This step is often ignored in favor of other goals that seem to be more dramatic, yet it is entirely a financial must have. An emergency fund is basically a savings account or money market that represents your liquid cash. The idea is to have it available when either an unexpected expense hits, or when there is an income disruption. That will not only enable you to weather a short-term financial storm, but will also help you to avoid borrowing money for the same purpose. The general rule on an emergency fund is it should contain sufficient cash to cover 3 to 6 months worth of living expenses. Once you have filled your emergency fund with a sufficient amount of cash, the next step will be to get out of debt. The cash flow you create in your budget by cutting expenses – that was going into your emergency fund – can now be redirected into paying off debt. There are different methods for getting out of debt, but Dave Ramsey’s debt snowball might be the most effective. You start by targeting your smallest debt, and paying it off. Once the smallest debt is paid, you target the next smallest debt You start small and get progressively larger with the debts, which is why it’s referred to as a “snowball”. There’s a strong element of psychological warfare when it comes to getting out of debt, and that needs to be in your favor if you’re to have any chance of succeeding. Hopefully you’re already saving for your retirement, even if it’s just a little bit each month. But as you get out of debt, your cash flow begins to increase, which will ultimately enable you to save a lot more money for retirement, and for everything else. As is the case with every other financial goal, the most important step in saving for retirement is to get started. If you have not done so already, start contributing to a plan with an amount that does not significantly hurt your financial situation overall. Once you have that going, your goal should be to increase your contribution level each year. You can do this by directing future pay increases into your retirement contribution. You can also redirect debt payments into retirement, once those debts have been paid off. And if your overall financial situation is strong, you’ll probably feel confident contributing a lump sum to your retirement plan, such as income tax refunds and bonus checks. There’s a whole host of reasons to save money that sits somewhere between an emergency fund and a retirement fund. Saving for your children’s college education is an example. You can also consider saving money for the purchase of a new car (so you can buy it without going into debt), or for replacing major components in your home, such as your roof or your air conditioning system. The purpose of saving for intermediate goals is obviously so you will have money available for major expenses that are completely predictable. But it’s also for the purpose of avoiding using debt to pay for them. It will do you little good to work hard to get out of debt, only to plunge back in when you’re faced with a major expense. That’s the debt merry-go-round so many people get stuck on, and have a very difficult time getting off of. Prevention is the best strategy, and that involves saving up money for what you know is coming in the not-too-distant future. Set up automatic weekly, rather than monthly, deposits to your savings accounts. Do $100 per week instead of $433 once a month. After a while, you barely notice the transfers, you are less likely to “miss” the money if it goes out in smaller amounts, and you are less tempted to spend the money elsewhere since it sits in your checking account for shorter periods of time. There are a whole bunch of contingencies you can’t possibly save enough money for, and that’s the whole purpose of insurance. There are various types of insurance coverage, and you probably need them all. This includes life insurance, health insurance, auto insurance, homeowners insurance, and business insurance if you are self-employed. And often overlooked benefit of insurance is it mostly protects your financial assets. This is why insurance is a fundamental part of smart financial planning. For example, homeowners insurance enables you to repair your home as a result of damage from certain catastrophes without having to drain other financial resources. Auto insurance does much the same, paying claims you would have to cover out of pocket if you have no insurance. Life insurance is typically used to replace the lost wages of a deceased wager earner. Once you realize insurance primarily protects your financial assets, you understand what’s a critical part of your overall financial plan. Financial planning doesn’t end upon your death – you need to make provisions for what will happen to your estate after your gone. At a minimum, if you don’t set up a will, your survivors will end up in probate court working out some sort of a deal to distribute your assets. At worst, your assets can end up disappearing down a sinkhole. This is why having a properly drawn and executed will is so important. It’s your final direction as to the state of your financial affairs. Make some time to get together with a trusted attorney, and set up a will that will distribute your estate according to your wishes. You can set it up one way now, and make modifications later on as your financial situation changes. You may also be surprised to find you experience a certain sense of peace upon completing your will. That peace will come from the fact you know you have done the best you can take care of your loved ones after your death. Don’t have a financial plan yet? Check out The Financial Success Blueprint which is my firm’s unique financial planning process. Setting up that college fund will be so important for future children. It’s something I would like to get an early start on, and it sounds like building a financial plan is the best way to go about doing it. Thanks for the advice. This is some really great basic advice on financially planning your future! Personally, I would say that I struggle a bit at saving for retirement. Since it seems so far away to me, I feel like it is justified for me to spend those savings. Plus, I don’t think I’m putting enough money into my retirement funds. It might be a good idea for a professional to take a look at all of that, and see if any adjustments need to be made! Great article, Jeff. I plan to pass it along to my daughters, both in their 20’s, thank you. While I do like the psychological advantage of paying off small debts first, one should also look at the interest rate of each debt. Go after the higher interest rate debts first, so you don’t end up paying way more than needed. Pay off 0% loans on or just before the intro period expires to avoid any penalties, which can be substantial. I had a friend who missed the final deadline on a 0% furniture loan by just a few days and interest had accrued (and was due) from the inception of the loan — in this case, 36 months and hundreds of dollars. Yikes! Be careful and make sure you understand all of the terms of deals such as these and are diligent about paying them off in time. Thanks again. The most important takeaway from this post that I found is the need for creating an emergency fund. Going down the path of paying off debt and then having an unexpected expense can be very discouraging. Living from pay check to pay check can be extremely stressful as well. I like the 3-6 month strategy. If both you and spouse work would you suggest 3-6 for each incomes? Agreed about if people followed this advice we’d be much better off. The average savings rate in America is 5.1% and that’s the average. There’s a whole lot of people out there saving a heck of a lot less or 0% of their savings. Putting money away and paying off debt is critical to successfully managing you finances. Always good to get back to basics and make sure your financial life is in order. I don’t have a will and thank you for reminding me to stop wasting time on this one. If everyone followed the advice in this post, we would be living in an entirely different world — one of financial responsibility and success. Starting with your goals is so important. It’s hard to know when you’ve reached success if you have no idea where you’re going — or why! Understanding what motivates you, and what you value, doesn’t sound like it belongs in financial planning but it’s a crucial first step.